Medical experts have known for a long time that there are about 80 different types of autoimmune disease, and new evidence suggests that we might be able to consider high blood pressure or hypertension as another autoimmune disease. High blood pressure or hypertension is a common cause of heart attacks, strokes and kidney failure, making it the biggest risk factor for disability and death around the globe. While a lot of investigation has pointed to obesity, high stress and diet as contributing to the disease, an exact cause has never really been established. Living with it gives sufferers an uneasy feeling. This latest research sheds more light on the condition. Scientists at Monash University in Melbourne, Australia discovered that when they stimulated the immune system of mice, they could cause hypertension. When they cut down the immune response it could restore blood pressure back to normal. Associate Professor, Grant Drummond, was involved in the experiment and has said that the results could open up a new way of treating high blood pressure or hypertension. Following the study he described how stimuli that can cause hypertension can in fact lead to an increase in B cells and the production of antibodies. These antibodies get stuck within artery walls and seem to promote inflammation. Inflammation causes the arteries to become stiff and scarred. Stiff arteries are what can cause hypertension. The research team discovered that mice raised without mature B cells didn’t develop hypertension; while at the same time, blocking cells in normal mice led to a return to normal blood pressure. In other words, it cured the mice of their hypertension. About 70 million Americans have high blood pressure and 4 million Australians struggle with it. Blood pressure is a force of blood that pushes against our artery walls as it circulates throughout our bodies. It usually rises and falls throughout the day; however, when it stays high for a long period of time, it can cause serious health complications. High blood pressure or hypertension is essentially the same ailment. For some people high blood pressure happens over several years. This is referred to as “primary hypertension.” Others experience high blood pressure when they also have kidney problems, thyroid issues, defects in their blood vessels, are on certain medications, suffer from obstructive sleep apnea or are abusing alcohol or drugs. This type of high blood pressure is called “secondary hypertension.” There is also a class of high blood pressure known as “pulmonary hypertension.” It is high blood pressure that takes place in the arteries of the lungs. 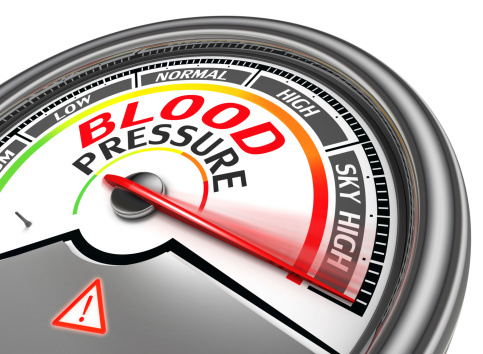 Age – high blood pressure or hypertension is more common in men and more likely over the age of 65. Genetics – high blood pressure tends to run in families. Race – statistics show high blood pressure is more common among black people. Overweight – you need more blood to supply oxygen to your tissues if you are overweight. This puts pressure on your artery walls. Tobacco use – chemicals in tobacco can damage artery walls, increasing blood pressure. Physically inactive – the more inactive you are, the harder your heart has to work, thus putting pressure on your arteries. Too much salt – consuming too much salt leads to fluid retention, and that can increase blood pressure. Too little potassium – if you don’t get enough potassium in your diet, you may accumulate too much sodium in your blood, which can lead to high blood pressure. Stress is another one of the high blood pressure causes that we should pay close attention to. Stress often leads to a temporary increase in high blood pressure. Unfortunately, many people try to fight stress by relaxing with alcohol or cigarettes, which only adds to the problem. Pregnancy can also lead to high blood pressure. In fact, high blood pressure occurs in up to eight percent of all pregnancies. Many pregnant women with high blood pressure have perfectly healthy babies, but some develop what is referred to as “gestational hypertension,” so they must be monitored closely. High blood pressure can harm the mother’s organs, cause low birth weight or lead to premature delivery. With most diseases we receive a warning through the presence of symptoms. So what are the symptoms of high blood pressure? Actually, most people with high blood pressure don’t have any. This is why the condition is called “the silent killer.” Sometimes high blood pressure can be dangerously high, and the person has no idea. On rare occasions a person can experience headaches and nosebleeds, but these symptoms don’t happen until the blood pressure is so high that it is life threatening. Most people have their blood pressure taken as part of a regular doctor’s appointment. Those who don’t have their blood pressure checked on a regular basis can discover it is high after damage has been caused to their kidney, their heart, or after they have had a stroke. There are a number of complications linked to high blood pressure or hypertension, aside from heart and stroke. High blood pressure can lead to aneurysms forming in the blood vessels. An aneurysm is a bulge in the wall of an artery. If it bursts it can be fatal. Blood vessels in the eyes can also be affected by high pressure. They can burst causing vision problems, including blindness. Leading a healthy life that includes exercise and a nutritious diet is the best high blood pressure prevention. The National Heart and Blood Institute developed the DASH diet based on studies showing that certain foods could improve the level of fats in our bloodstream, which can reduce the risk of cardiovascular disease. Being active is an important part of maintaining good overall health, but research shows it is an excellent stabilizer when it comes to blood pressure. Recent studies also suggest that exercise can benefit people who suffer from pulmonary hypertension. In the past pulmonary hypertension patients were discouraged from exercising due to fear it would add extra stress to their hearts, but a study conducted by cardiologists at UT Southwestern Medical Centre showed low levels of exercise had a positive impact on the heart and overall health of those with pulmonary hypertension. The authors of the study do suggest that if you have pulmonary hypertension, you consult with your doctor before starting an exercise program. It is never good to take matters into your own hands when it comes to your health; however, as an added precaution, you can monitor your own blood pressure in addition to having your doctor check it on a regular basis. Home blood pressure monitoring kits can be purchased at some pharmacies and medical supply outlets (some pharmacies also have blood pressure machines free for customer use). This can help you keep a closer eye on your blood pressure and help alert you to potential problems. Home monitoring kits do have limitations, and some kits are more accurate than others. It is important if you are taking medications for high blood pressure to continue with that medication even if you suddenly get a normal pressure reading. Talk to your doctor first before taking any drastic steps. Monitoring and treating blood pressure can be tricky. For some people the slightest amount of stress can give a false reading. In certain cases, the body will reject hypertension medications, making it very difficult to lower blood pressure. The Australian study that suggests blood pressure or hypertension is an autoimmune disease could help reform the way many people who are resistant to traditional drug therapies are treated in the future.